PRESS RELEASE: Berkleemusic UK, the continuing education division of Berkee College of Music offering over 130 online music courses, has announced their 2010 Spring Berkleemusic UK Scholarship program. 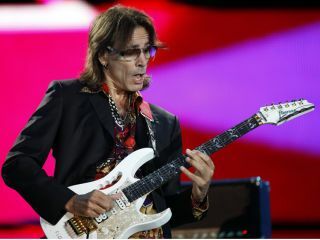 Sir George Martin, producer, Jeff Beck, guitarist, Paul Oakenfold, DJ, Simon Napier-Bell, veteran artist manager, and Steve Vai, guitarist, join a growing list of celebrities who are helping to support Berkleemusic's promising online students to achieve their dream of a life in music. These celebrities all support music education through their work, and Berklee is proud to be associated with them. "Music is a wonderful thing and something that I have been able to enjoy all my life," said Berkleemusic UK Scholarship honouree Sir George Martin. "Getting access to a great musical education can only be a good thing and now with this initiative, UK-based students are going to be able to access Berklee's remarkable resources directly. I am proud to be a patron of this innovative programme and look forward to seeing it and the students flourish in the years to come." This scholarship is available only to students in the UK and the application deadline is April 15th. For more information on the scholarship program, please visit Berkleemusic. The Berkleemusic UK Scholarship is designed to reward prospective Berkleemusic students. The recipients will receive an award of £900 to be used towards paying their tuition and helping them achieve their goals. A total of £45,000 in scholarships will be awarded to Berkleemusic UK students over the next 5 years. Berkleemusic.com is the continuing education division of Berklee College of Music, delivering online access to Berklee's acclaimed curriculum from anywhere in the world. Berkleemusic's award-winning online courses and certificate programs are accredited and taught by the college's world-renowned faculty, providing lifelong learning opportunities to people interested in music and working in the music industry. As the business of music continues to move online, Berkleemusic is taking a leadership role in educating the next generation of producers, performers, and entrepreneurs on this evolving industry landscape. Berkleemusic's students come from over 120 countries around the world, and include Grammy award winners, managers, artists, publishers, music business entrepreneurs and major international touring acts.